The first EP release online from Monotonik, and that quirky English idm-ster, 3818919/w, comes up trumps with some beautiful tracks influenced by everything from Bola through Bochum Welt to Plone. 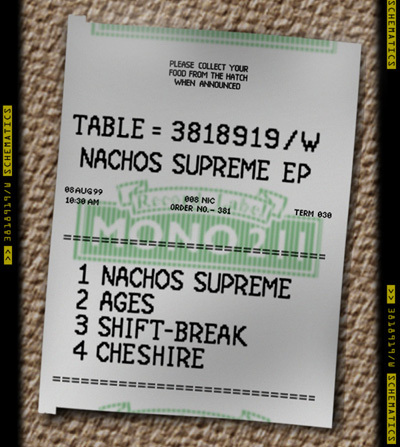 The lead track, “Nachos Supreme”, is full of wonderfully twisty riffs and nimble drums, and “Ages” and “Cheshire” float into melodic ambience of the slightly surreal, fevered kind, whilst the final tune, “Shift- Break”, uses clunks and robot voices to bring the noise, 1982-style. Good show, old chap. 3818919/w also did the cover for this mp3 to reflect some of his favourite nights down the pub with a plan, a beer, and a plate of tortilla+tomato. Mm, cheesy.